Commissioned 1902 and purchased 1903 from the artist by Mr. and Mrs. John W. Simpson, New York; gift 1942 to NGA. Salon, Société nationale des beaux-arts, Paris, 1904, no. 2080. Rodin: Sculpture, Drawings, Prints, National Gallery of Art, Washington, D.C., 1946, no. 3, as Portrait of Mrs. Simpson. Rodin Rediscovered, National Gallery of Art, Washington, D.C., 1981-1982, no. 157. Grappe, Georges. Catalogue du Musée Rodin. Paris, 1927: 91-92. Grappe, Georges. Catalogue du Musée Rodin. 5th ed. Paris, 1944: 110. Summary Catalogue of European Paintings and Sculpture. National Gallery of Art, Washington, 1965: 168. European Paintings and Sculpture, Illustrations. National Gallery of Art, Washington, 1968: 149, repro. Vincent, Clare. 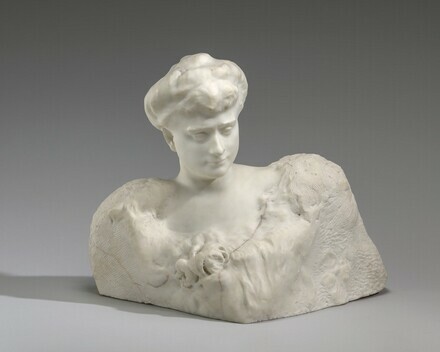 "Rodin at the Metropolitan Museum of Art: A History of the Collection." The Metropolitan Museum of Art Bulletin (Spring 1981): 24. Hare, Marion. "The Portraiture of Auguste Rodin. Ph.D. dissertation, Stanford University, 1985: 412-417. Rilke, Rainer Maria. Auguste Rodin. Translated in G. Craig Houston. Rodin and Other Prose Pieces. London, 1986: 31. Butler, Ruth. "Rodin and His American Collectors." In Weisberg, Gabriel P., and Laurinda S. Dixon, eds. The Documented Image: Visions in Art History. Festschrift in Honor of Elizabeth Gilmore Holt. New York, 1987: 87-110. Grunfeld, Frederic V. Rodin: A Biography. New York, 1987: 442-443. Beausire, Alain. Quand Rodin Exposait. Paris, 1988: 249. Butler, Ruth. Rodin. The Shape of Genius. New Haven and London, 1993: 411-414. Sculpture: An Illustrated Catalogue. National Gallery of Art, Washington, 1994: 207, repro. Butler, Ruth, and Suzanne Glover Lindsay, with Alison Luchs, Douglas Lewis, Cynthia J. Mills, and Jeffrey Weidman. European Sculpture of the Nineteenth Century. The Collections of the National Gallery of Art Systematic Catalogue. Washington, D.C., 2000: 373-376, color repro. Dickerson III, C.D. "The Sculpture Collection: Shaping a Vision, Expanding a Legacy." National Gallery of Art Bulletin 56 (Spring 2017): 8, repro.